In the decade after Columbine, the U.S. saw 80 more school shootings, even as millions of dollars have been spent on metal detectors, security cameras and emergency response plans. So what's the deal? Over two years ago, dad of Columbine victim spoke these words which couldn't be more true! 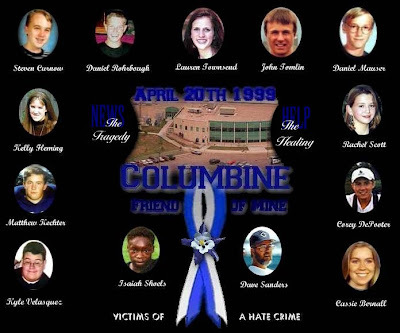 "When my son Dan was murdered on the sidewalk at Columbine High School on April 20, 1999, I hoped that would be the last school shooting. Since that day, I’ve tried to answer the question, "Why did this happen?" Sadly, our schools are not safe. In fact, we now witness that within our schools. Our children have become a target of terrorists from within the United States." Many people I know are celebrating today. Pot-head holiday. Rather annoys me as this it the first thing that comes to my mind. It's tragic, I won't deny that. You know Columbine is part of the reason I don't hide the goth/punk side of me from my kids? I can't help but wonder that if those boys that did the killing had a positive role model that was more like them, would they have still done it? Would they have even been bullied? I did manage to help one little goth girl turn her life around and start taking school more seriously some years ago. That felt pretty good. It's easy to point the blame at the schools, and I will even go so far as to say they are a contributing factor to the moral decay in this country. However, I've noticed a severe lack of parenting that seems to get worse every year. Just because a parent sends their kids to a public school does not mean then can't teach them at least a few simple things under the heading of right and wrong. I've brought the entertainment and the media up with you before. It's also part of the problem. It would seem more and more every year decency is being cast aside in the name of free speech and free expression. Long before you and I were born, America was a different place. Compare the Ed Sullivan Show to modern MTV and you will see and extreme difference. And while I'm all for free speech and free expression, there's a time and a place for everything. Whatever happened to "not in front of the kids"? Now it's all in front of them and in their faces. One thing I forgot to say, one thing my mother said not too long go, "Kids don't really have role models these days." I couldn't really argue with her on that one. Today is also Hitler's birthday, which is no coincidence! "I've noticed a severe lack of parenting that seems to get worse every year. Just because a parent sends their kids to a public school does not mean then can't teach them at least a few simple things under the heading of right and wrong. "Here again, we completely agree! How exactly do parents not notice that their kids are building bombs in the garage or hiding automatic guns in the house? Typical white suburbia - rich kids who have it all, except the love, attention and moral direction from their parents! Another key piece of info that the media isn't reporting is that Dylan & Eric (like most of the recent school shooters) were on psychotropic drugs (Prozac, Zoloft, ect.) which altered their minds and likely contributed to their psychopathic shooting spree. Several things played a part, the neglect at home, cruelty at school, corrupt music, and most importantly a godless worldview. During this massacre, the boys were wearing shirts that read, "It’s time to put NATURAL SELECTION & SURVIVAL OF THE FITTEST back on track!" - and I'm sure they made Darwin proud! Well happy birthday to the man gave the world Volkswagen and a face to social Darwinism. I can't really argue with you here. Save for that I won't try to put words in Darwin's mouth. Survival of the fittest doesn't really apply to us. If it did, we would have never invented medicine and we would think the sick and elderly are only good for human shields. Just something to think about. I hope you don't mind, but I did link this post in a blog of my own about today. It was a sad day thats for sure. Unfortunately, it happens not just in schools. Up here in our city, the asian gangs are shooting randoms on the street.